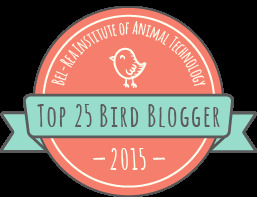 I signed up to be a Shorebird Steward through the Conserve Wildlife NJ program. This program asks people to work at protected beaches along the Delaware Bay during the spring shorebird migration period. Asa Shorebird Steward, the volunteer should educate people about beach closings in order to protect the endangered Red Knot shorebirds. These birds migrate from Argentina all the way to the Arctic to nest, stopping at Delaware Bay to fatten up on horseshoe crab eggs during crab spawning season which runs from May 7 to June 7 this year. Basically - keep people off of the beaches that are designated as protected. There are several beaches with this status along the bayshore - the famous Reed's Beach, Cook's Beach, Kimble's Beach, Foresque, and the Villas. What? The Villas is a mecca for horseshoe crabs and endangered shorebirds? Yep. The Villas. Guess where our new shacks are? Yep. Smack dab in the middle of the protected beach. What luck. Obviously, I volunteered for the Villas duty which turned out to be really smart since our refrigerator quit working and we had to make a quick trip to Cape May Court House to buy a new one (which Di found on Craig's List really cheap) and also let the Comcast guy in to hook up cable TV (we have been miserable without the Phillies games). I worked on the Sunday after the World Series, this past Saturday, and today. The first day was kind of a bust. No crabs, very few birds, and zero Red Knots. Yesterday was a little better. About 100 crabs came onto the beach at high tide (around 1 PM) and there were a few more birds but still no Red Knots. The majority of birds were Laughing Gulls, Semi-palmated Sandpipers and Sanderlings. The big downer of the day was the text message I recieved stating "Red Knots are here. 5000 + Red Knots at Reed's Beach" Meanwhile I was twiddling my thumbs in the Villas. Today was the best day so far with over 2,000 crabs on the beach at high tide, a few thousand shorebirds, and a few dozen Red Knots mixed in. Here is a photo (click to enlarge) showing horseshoe crabs (the big gray blobs in the foreground) and shorebirds (the small gray dots that stretch to the end of the beach). Here is a close-up of the horseshoe crabs mating (still rated G). The large crab in the center is the female. All of the other crabs are males trying to fertilize eggs. 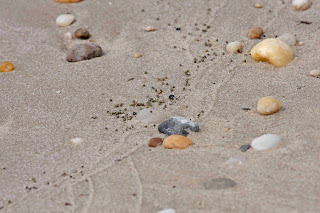 Here is a close-up of the eggs - the little green dots in between the stones. It reminds me of tapioca. These eggs consist of alot of protein and fat that the shorebirds (particularly Red Knots) need to successfully breed this season. 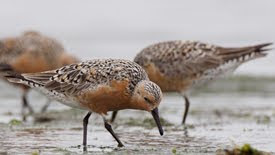 This is a photo of a Red Knot taken by Christopher Wood from the Allaboutbirds.org website. Remember, I didn't get to see many so I didn't get a photo for myself.